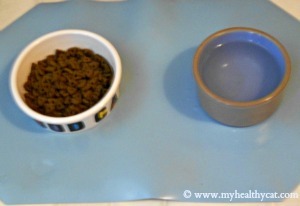 "How much and what type of protein should be in your cat's food?" How Much Protein Do Cats Needs? 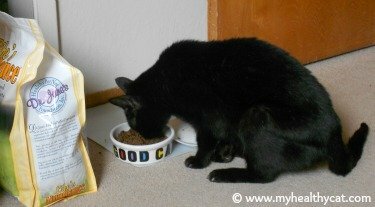 Do felines need high protein cat food? And if so, "how much?" Because they are "obligate carnivores," the answer is "yes," healthy felines need protein in their diets. But if you veterinarian advises a different diet for your particular cat, please follow his or her recommendation (and/or do further research). Read on to find out "how much" and "what type" of protein you should be feeding your healthy kitty. Note: Because too much protein, as well as not enough protein, can lead to health problems in your cat, it's really best that you ask your veterinarian how much your particular and unique kitty needs. Your veterinarian will often make a recommendation for a particular brand, but sometimes these recommendations are influenced by the brand(s) they are selling. So you might want to ask them for general guidelines (e.g., does my kitty need high protein cat food, and if so, how much), then do your own research and comparisons. The Association of American Feed Control Officials (AAFCO) sets minimum guidelines for nutrition standards for pet food. Pet food companies do not have to legally follow these standards, and some people believe that their standards, in general, are not set high enough for the good health of our beloved pets. But we can still use AAFCO guidelines as a starting point. "Growth and Reproduction" foods should have at least 30%. "Adult Maintenance" foods should have at least 26%. This means you cannot entirely rely on the label, as most companies do not list their ingredients on a "dry matter" basis. The protein of high protein cat food, or any other pet food, will be listed as "Crude Protein (min)" with a percentage next to it. You'll have to do some math to actually decipher the label to make sure the company is meeting the minimum standards. You may find it interesting that dry pet food (kibble), at first glance, appears to have more protein than canned food. But the numbers rapidly change when you consider the moisture content of the products. How to Calculate "Dry Weight Protein"
Find the percentage of moisture (kibble usually has around 10% moisture, and canned food around 25%) and subtract from 100%. Find the "Crude Protein" number and divide it by the result from #1 above. Multiply the result from #2 above by 100. This is the total dry matter protein in your kitty's meal. Let's use the labels from the canned food and kibble I feed my healthy cat for examples. With a result of 50%, I think it's safe to call this a high protein cat food. You might notice that it looked like the kibble was going to have a lot more protein than the canned food, but that's when we are only looking at the percentages and not accounting for all the moisture content. Easier Way to Calculate "Dry Weight Protein"
"For a canned product that is 75 percent moisture (25 percent dry matter), multiply the guaranteed level times 4. For a 10 percent moisture dry product, multiply by 1.1." Even though we might be able to decipher the pet food label and find out the true percentage content of each of the ingredients, the "Guaranteed Analysis" on the package or can does not guarantee the quality or source of the protein. The protein could be from animals and/or it could be from other sources such as grains. Because felines are "obligate carnivores" (which means they must have meat in their diets to help ensure good health and a long life), the better protein source health-wise is going to be a quality source of meat. Unfortunately, many of us serve our feline friends brands that are based on starches first and animal protein only as a second or third runner-up. There are quite a few reasons to serve protein that is animal-based rather than grain-based. The feline digestive system is poorly designed to actually extract the protein from grain and grain-based foods before it passes out of their system. Grain basically provides bulk, and calories, but little protein, making it certain that your kitty will have to eat more food to get the nutrients she needs. This alone contributes to the problem of being overweight. High protein cat food with a solid meat base helps solve this problem by providing protein in the form and at the levels natural to the feline biology. Even worse than weight problems, grain based diets are associated with digestive, bladder, kidney and allergy problems. You may have heard that kidney problems are usually treated with a low protein diet - but that was the standard at a time when all high protein diets still tended to be high in grain protein. Research is indicating that the problem wasn't the protein, but the source of the protein. As for the bladder and allergy problems? Grain is so closely associated with these that the first step in treating a pet is often to change the diet to remove or control the nature of the grain sources. You've probably noticed a higher number of "grain-free" pet foods at the better pet supply stores. A high protein cat food is an automatic safety net to help prevent and reduce cat allergies. You want to provide the best feline nutrition possible for your kitty to ensure good health and well-being. Providing your cat or kitten with the best possible diet that includes high protein cat food is one way to accomplish this. If for some reason your veterinarian recommends against a high protein cat food due to your cat's individual health issues, you should follow your veterinarian's advice. If for some reason that advice does not seem to make sense to you, then ask questions and/or please consult with another veterinarian. The information provided in this cat food article and on this site is intended for informational purposes only, and is not intended to replace your vet's advice. If you suspect your kitty is sick or ill, please consult your trusted veterinarian. Life's Abundance Premium Cat Food is my #1 recommendation for the best high protein cat food online (or anywhere!). This is what I feed my healthy cat. She loves it and I feel confident that she is getting the best possible feline nutrition. Try a sample to make sure your feline friend likes the taste. Only Natural Pet Store is my #2 recommended source for the best pet food online. They carry only natural pet products using the best ingredients. The pet foods they carry are made from "human grade" products and exceed all AAFCO standards. Even if you don't buy your pet food online, take a look at Only Natural Pets' website for specific brand ideas for the healthiest nutrition you can get at local top quality pet supply stores. Choosing the Best Cat Food is an article that provides more info to help you find the right cat food for your feline friend.